Mergers, acquisitions, and alliances are more vital today than ever before in driving business success. This indispensable guide offers proven strategies and sound solutions to the multitude of integration issues that inevitably arise, and shows how to create a combined business that meets its strategic and financial objectives, competes better, and offers personal and organizational enhancements. Dubbed “merger mavens” by Fortune magazine, the authors report lessons learned from their experience in over 100 combinations. Executives, managers, and employees alike—in all industries and sectors—will find useful examples, strategies, and tools here. “This book will help both M&A veterans and those new to the game. 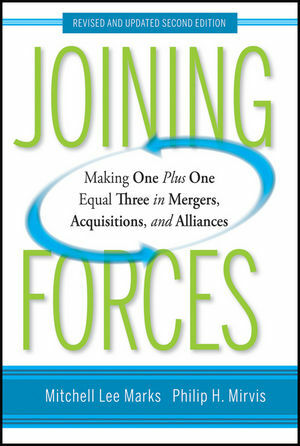 The authors provide great insights into the human, cultural, organizational, and strategic factors that matter in M&A success.”—Richard Kovacevich, chairman and CEO emeritus, Wells Fargo & Co.
6 Putting Companies Together—The Transition Structure. 13 Joining Forces—Building M&A Competency.